Much work has been done on cognitive processes and creativity, but there is another half to the picture of creativity -- the affect half. 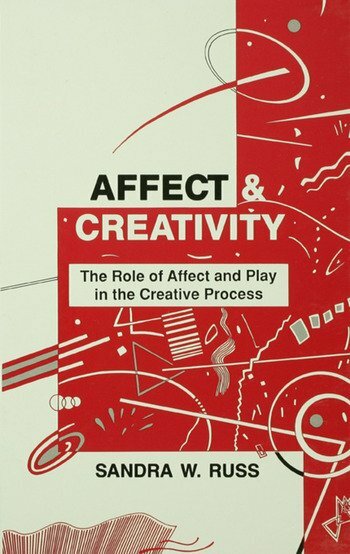 This book addresses that other half by synthesizing the information that exists about affect and creativity and presenting a new model of the role of affect in the creative process. Current information comes from disparate literatures, research traditions, and theoretical approaches. There is a need in the field for a comprehensive framework for understanding and investigating the role of affect in creativity. The model presented here spells out connections between specific affective and cognitive processes important in creativity, and personality traits associated with creativity. * Is affect an important part of the creative process? * If it is, then how is affect involved in creative thinking? In addition, Russ presents her own research program in the area of affect and creativity, and introduces The Affect in Play Scale -- a method of measuring affective expression in children's play -- which can be useful in child psychotherapy and creativity research. Current issues in the creativity area are also discussed, such as artistic versus scientific creativity, adjustment and the creative process, the role of computers in learning about creativity, gender differences in the creative process, and enhancing creativity in home, school, and work settings. Finally, Russ points to future research issues and directions, and discusses alternative research paradigms such as mood-induction methods versus children's play procedures. Contents: Preface. Affect and Creativity. Primary Process, Affect, and Creativity. Children's Fantasy, Play, Affective Expression, and Creativity. The Affect in Play Scale. Personality Trait Approach to Creativity. Mood-Induction and Motivational Systems Approaches to Creativity. Neurological Processes, Artificial Intelligence, and Creativity. Implications for Home, Educational, and Therapeutic Environments. Affective Components of the Creative Process: Conclusions and Future Research Directions. Appendix: The Affect in Play Scale. "...a welcome piece of work in an otherwise ignored field....One of the real strengths of the book lies in its interdisciplinary synthesis of relevant empirical findings....offers the field one of its first synthetic models of personality, affect, and cognition....provides a thorough and competent review of the literature in social, personality, developmental, clinical, neurological, and educational psychology areas as they relate to creativity and affect....should be read by any investigator interested in creativity, affect, play, or children's fantasy." "Painstakingly researched, selectively encoded, creatively synthesized and the result is a truly important book. Sandra Russ' own research with play and fantasy in young children is original, heartwarming, and a welcome contribution to a long neglected area. How rewarding to find information long laid away in dusty corners of one's mind fall into affective relevance and begin to spin in creative resonance with this tightly packed, carefully reasoned text." "In Affect and Creativity, Professor Russ explores the most difficult side of creativity -- the subjective, affective side -- in an objective and convincing manner. [The book] covers all of the critical bases, including primary process, mood, children's play, and neurology, and does so with a careful treatment of the empirical research and a concern for educational and clinical implications. Individuals already studying creativity will no doubt appreciate Russ' efforts, and it would surprise me if Affect and Creativity doesn't attract serious new students to the field."